The Rangers will be looking to continue their march to the playoffs and towards the President’s trophy, but for the first time in nearly two months, they get to do that with Henrik Lundqvist back in net. Photo courtesy of MSG Photos. Following a nice rebound win against the hottest team in the NHL, the Ottawa Senators, on Thursday, the Rangers (47-19-7) will now take on arguably the coldest team in the NHL when they matchup against the Boston Bruins (36-25-13), a team that has lost their last six games. This is the third and final matchup between these two teams this season, with the home team winning each of the first two games in this series. The Bruins shut out the Rangers 3-0 at TD Garden on January 15th, and the Rangers grinded out a 3-2 win at MSG. Cam Talbot was in net for both of those games, making 18 saves in the 3-2 win. Rick Nash, Derick Brassard, and Derek Stepan all scored in that game. The Bruins are coming off of a devastating 3-2 overtime loss on Thursday against the Ducks, blowing a 2-1 lead with less than a minute to go. That gave them their sixth straight loss, and Boston is still fighting for their playoff lives. They are tied in the Senators with points, but Ottawa has one game in hand. Don’t count out Florida either, as they trail by just three points, and play the Bruins two more times this season. Needless to say, this is a crucial game for the Bruins. Tuukka Rask will be in net for Boston, as they continue to ride him heavily in hopes of a playoff berth. Rask continues to be one of the better goalies in the league, with one of the best glove hands as well. Rask is 29-19-12 this season with a 2.34 GAA and a .921 save percentage. While the Bruins have experienced guys like Patrice Bergeron and Brad Marchand, what has really helped them lately is the contributions that have been getting from their younger players since getting called up. Boston probably didn’t expect such a huge void on the right wing when they decided not to resign Jarome Iginla in the offseason, and struggled to find someone to fill that spot. But the 18 year old David Pastrnak, the Bruins first round draft pick last year, has done a nice job of filling that spot. With 22 points (9-13-22) in just 38 games, Pastrnak has added a bit of depth to a lineup that desperately needed some. He has not scored in seven games, so he could be primed to reach the double digit mark today. Ryan Spooner is the other young rookie that has been contributing to the Bruins since his call up. Since his first start on February 21st, Spooner, a center, has amassed six goals and seven assists in 16 games, and has developed into an offensive weapon on the team’s second line. Three of his goals and two of the assists have come on the power play as well, making him dangerous at all times. The Rangers will also have a different face in net today, as Henrik Lundqvist will be making his long-awaited return to the lineup, making his first start since February 2nd, and his first against the Bruins this season. 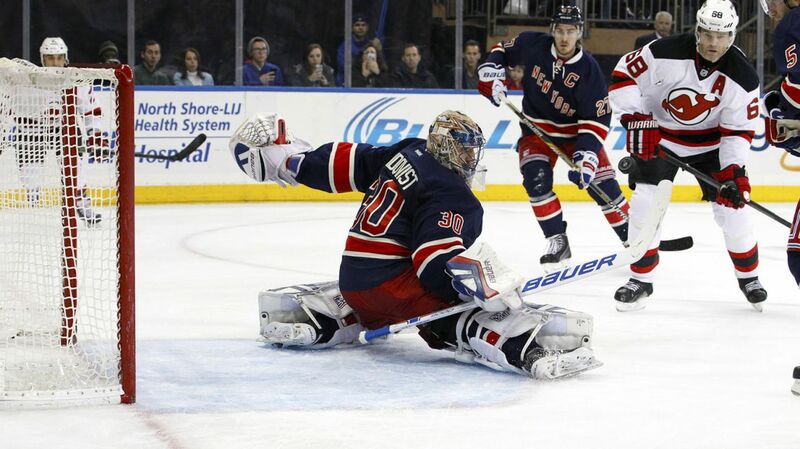 Lundqvist was red hot before the injury, with a 16-4-0 record, a 1.82 GAA, and a .938 save percentage. He will obviously need a bit of time to get his timing down and re-adjust to the NHL pace of play, but this is huge for the Rangers, and a healthy, rested Henrik Lundqvist is a dangerous weapon for New York. He will be wearing the mask designed with Jeff Gordon in today’s game, which will later be auctioned off for his charity. 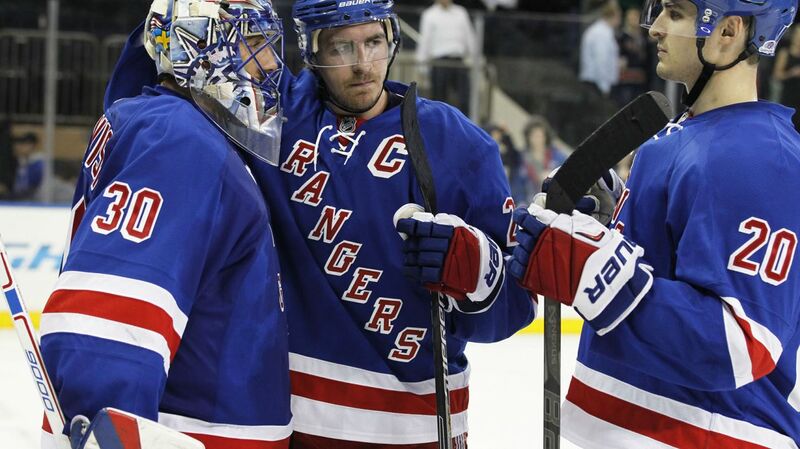 The Rangers are getting a huge boost to their lineup with the return of Henrik Lundqvist. He will need some games to get his timing down, but having him back in net is great for New York. Photo courtesy of MSG Photos. Chris Kreider had a monster game on Thursday, recording two goals and an assist in the first period along, giving him his first 20 goal and 40 point season in the NHL. With one assist, Kreider will have set career highs in goals, assists, and points this season, continuing his growth at the NHL level. His speed and size makes him a tremendous threat every game, and his confidence is sky high right now. Carl Hagelin and Dominic Moore were tremendous in the in over the Senators, playing a major role on the penalty kill. New York was shorthanded six times, and both of them had a huge part in keeping Ottawa off of the board. Hagelin has flourished alongside the rookie Kevin Hayes, who has 22 points (8-14-22) in his last 27 games, and is a better offensive player this season, getting more chances and finishing at a good rate. 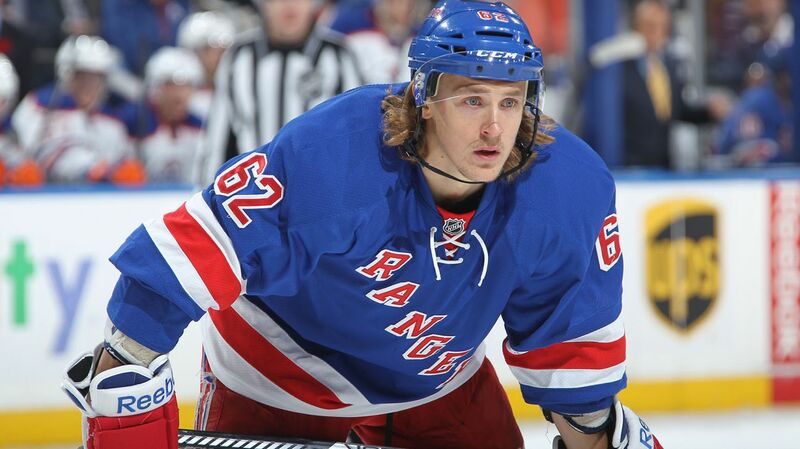 Look out for Hagelin in today’s game. Carl Hagelin was tremendous defensively on Thursday, and alongside the red-hot Kevin Hayes, Hagelin will have some quality chances in today’s game. Photo courtesy of MSG Photos. Mats Zuccarello is in midst of a four game point streak, with two goals and four assists in that span. Playing alongside Derick Brassard and JT Miller, he has found success, and is finding the back of the net now. He will be looking to extend his point streak. Boston natives Chris Kreider, Kevin Hayes and Keith Yandle will all be returning to their hometown, and will have a lot of support from their family in the stands, so they may have some pep in their step today. The Rangers and the Bruins will faceoff at the TD Garden at 1PM. The game will be broadcasted on MSG Network. Posted on March 28, 2015, in Game Previews and tagged Alain Vigneault, Boston Bruins, Cam Talbot, Carl Hagelin, Chris Kreider, Dan Boyle, Dan Girardi, David Pastrnak, Derek Stepan, Derick Brassard, Dominic Moore, Henrik Lundqvist, James Sheppard, Jesper Fast, JT Miller, Keith Yandle, Kevin Hayes, Kevin Klein, King Henrik, Madison Square Garden, Marc Staal, Martin St. Louis, Mats Zuccarello, Matt Hunwick, MSG, MSL, New York Rangers, NHL, NHL 2014-2015 Season, NY Rangers, NYR, Ottawa Senators, Patrice Bergeron, Rangers, Rangers Nation, Rangerstown, Rick Nash, Ryan McDonagh, Tanner Glass, The Ranger Zone, Tuukka Rask. Bookmark the permalink. Leave a comment.